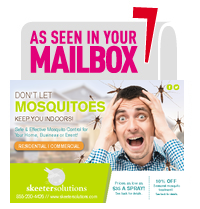 Skeeter Solutions can rid your residential, commercial or municipal property of annoying and potentially harmful mosquitos. Our services help protect your family, friends and animals from mosquito-borne illnesses like the West Nile virus and encephalitis. Our highly trained technicians will put their extensive experience to work for you. Whether you need immediate help or you’re looking for a long-term solution, our team will locate and exterminate the mosquitos on your property with environmentally safe techniques. 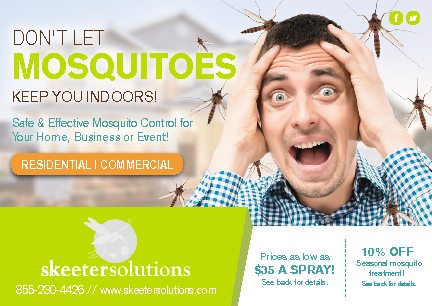 The Skeeter Solutions team has decades of combined experience in mosquito control. Using innovative technology and eco-friendly sprays that are safe for use around kids and pets, we’ll make sure you can enjoy your outdoor space without being distracted by unwelcome pests. Planning for a special event? Whether you’re having a backyard wedding, graduation party or other get-together, our experts can help ensure your big day is pest-free. Want to enjoy the outdoors every day? You don’t need to worry about pesky mosquitos ruining your fun. We have a variety of solutions, including mosquito barrier spraying and mosquito misting systems that can give you the freedom to enjoy your outdoor space whenever you want to. Tired of mosquitos assaulting your customers, clients or the general public? Whether you’re running a business in one of our service areas or you’re in charge of ensuring the public stays safe enough to enjoy the outdoors in your city or town, Skeeter Solutions can give you—and your visitors—peace of mind. Maintaining livestock and stables or horse barns? Your pets and livestock deserve the same protection from disease as you. Skeeter Solutions can keep your animals’ living areas pest-free and help keep them safe from illness and disease. Call Skeeter Solutions at (251) 279-0345 to tell us what you need. Our team of professionals will carefully evaluate your needs and get to work ridding your property of mosquitos right away. Whether you’re already experiencing a mosquito problem on your property or you’re planning ahead, we’ve got you covered. Your safety is our priority. The ingredients in our sprays are non-toxic to humans, pets and plants. In fact, the same ingredients are commonly used in kids’ and pets’ lice shampoos; that means it’s safe to use where your family plays. Subscribe to our email newsletter for useful tips, promotions and announcements. Copyright © 2013 Skeeter Solutions. Web Development by Rivenbark Media.